K.T. 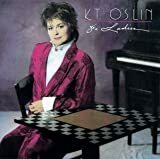 Oslin's, "Love Is Strange"
Somebody say to me K.T. how do you call your loverboy? She's boasting about her extraordinary prowess when it comes to picking up guys and taking them to bed. In the live version of the song, which she performed at Farm Aid 1990, K.T. 's boasting about her sexual prowess in the last line.